If you have a little girl in your life aged from two til teen then you'll have been living under a rock if you haven't heard of Disney's Frozen! It's Disneys adaptation on the classic Snow Queen fairytale. The two sisters of the story, Anna and Elsa have to be the hottest princesses in the world right now. As I have two daughters my day is pretty much filled with constant bursts of 'Let it go' and 'Do you wanna build a snowman? ', I know you've been there....I had a search on-line to see if there were any Frozen doll knitting patterns available, and to my surprise there wasn't any knitted versions. So I thought it would be great to come up with a freebie for you all. 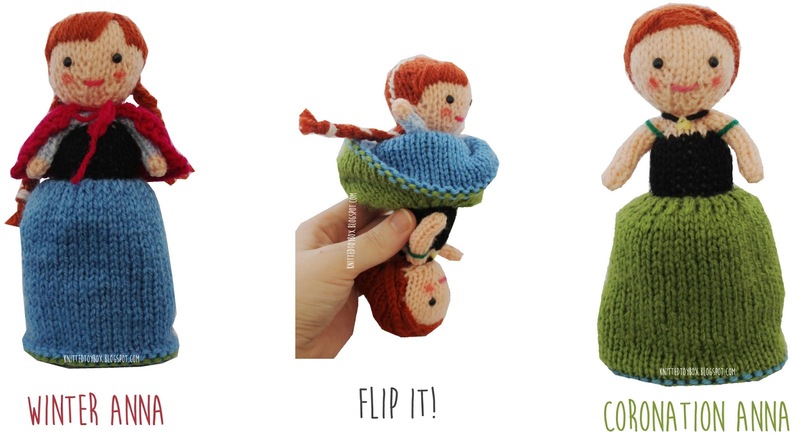 I think the flip doll design is the perfect way to incorporate the two main outfits which Anna wears in the film. On one half of the doll we have Winter Anna with distinctive blue dress, pink cape and pigtails. 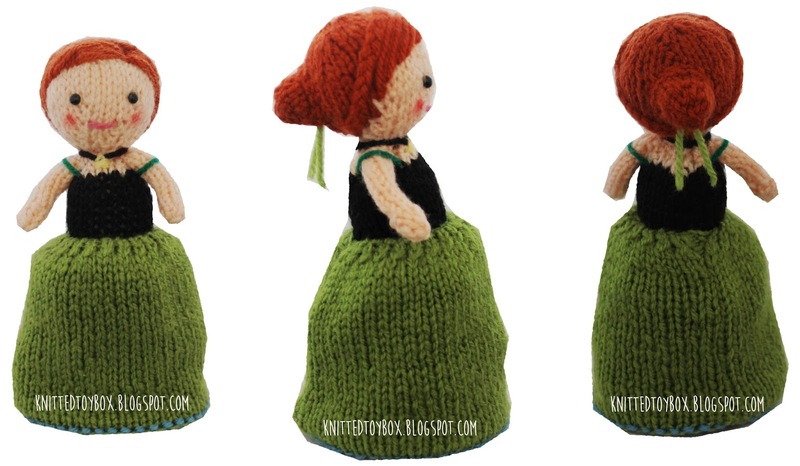 Then flip her over and you have coronation Anna with her green dress and regal hair updo. 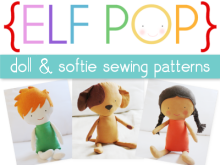 I am so pleased with how these dolls turned out and they have the ultimate seal of approval from my girls, I'm sure your little girls will love them too. Oh and you'll probably have a few requests from their friends too! The pieces are fairly quick to knit up and the making up part is what will take up most of your time, but they are a fairly quick knitting project. Please note that the head has intarsia for the hair, however if your not comfortable with intarsia then I recommend knitting simply knitting the head all in the skin colour and then following a doll hair tutorial, there are some great ones to be found here. 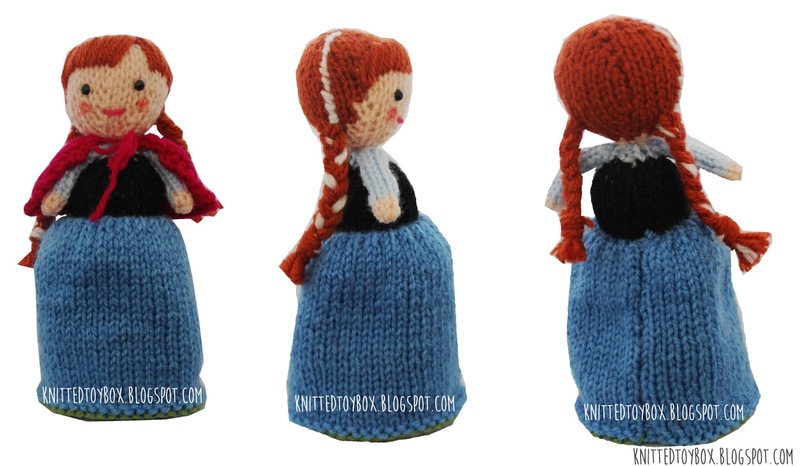 Click here for the Elsa Doll pattern. Please dont' use toy safety eyes on a toy intended for a child under 3 years old, they are a potential choking hazard. I recommend embroidering on any features to make the toy baby friendly. Please click here for my copyright info. 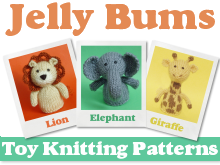 You are free to sell finished toys for this pattern but don't copy the actual pattern and sell it for profit. 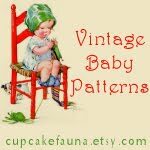 If you post photos online please link back to the pattern page so other can find the pattern too. For row 3-14 the stitches in black are where skin yarn should be used and the stitches in red are where rust yarn should be used. Cut yarn, leaving a long tail. Draw tail through remaining stitches and pull tightly and secure. Use tail to mattress stitch row ends closed. Stop halfway down to add safety eyes/embroider eyes and a mouth and stuff. Close remaining opening and stuff, leaving a long tail to sew onto body. Cut yarn, leaving a long tail. Draw tail through remaining stitches and pull tightly and secure. Use tail to mattress stitch row ends closed. You can stop halfway down to stuff lightly but it is not required. Close remaining opening leaving a long tail to sew onto body. Cut yarn, leaving a long tail. Draw tail through remaining stitches and pull tightly and secure. Use tail to mattress stitch row ends closed. Close remaining opening leaving a long tail to sew onto body. Weave in the loose ends from the BO stitches. 1. Fold the skirt piece (right side facing out) in half and use the long yarn tail and attach the BO stitches to the body. 2. Use the long yarn tail from the body piece and stitch down the back (try to ignore the skirt piece during this part). Stuff the body just before closing at the winter body neck. 3. Flip the body and skirt so that the coronation side is showing. Use a long green yarn tail and mattress stitch together the row ends of the skirt. 4. Flip the doll over to the winter body and skirt. Use a long blue yarn tail to mattress stitch together the row ends of the skirt. 5. Attach a head to each body. 6. Attach the skin coloured arms to the coronation side and the blue arms to the winter body (blue side attached to the body). 7. For winter hair I embroidered on a white hair strand. Taking approx 5x10 " pieces of yarn sew through the side of the head, even up the yarn. Braid the yarn pieces and repeat on the other side. Use yarn to create a fringe from the hairline across the forehead. 8. For the coronation hair, repeat the braid step on one side of the hair with approx 5 x 22" length of yarn. Brain the hair and wrap around the head, securing as you go along. Attach the bun at the back and attach a scrap piece of green yarn to the underside of the bun.Add a side fringe with yarn from the hairline to the forehead. 9. Add finishing detail such as green straps and a necklace to the coronation body. You can also add flower embroidery to the skirts and body. 10. Add a little flush to the cheeks with a cotton swab (que tip) and some red blush. P.S Sorry about the watermarks all over the pics. I know it doesn't look too pretty but I've had a lot of problems recently with people trying to sell the free patterns on ebay. Frozen things are pretty popular right now so I don't doubt people will try to do the same with these patterns. I suppose every party has a pooper and those who try to take more by profiting from what others offer for free. Please don't do this as it's not only theft but the listings are promptly removed by the VERO program and your account will be suspended for copyright infringements.